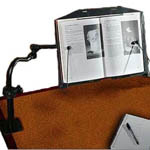 The Levo™ BookHolder Desk Model offers five unique movements to perfectly place your book in the most comfortable, ergonomic reading position. 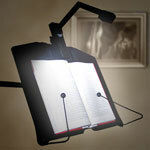 It easily clamps to your desk or table, and holds your reading material while you take notes, type, or relax with your favorite author. Minimum height: 4" above desk (measured from bottom of book). Maximum height: 8" above desk (measured from bottom of book).